Awarded through a national design competition in 2011, the building attempts to recall the history of Borden Park through a reintroduction of the playful qualities of its status as an amusement park in the early 20th century. The scheme makes overtly manifest the iconic geometry of classical parks and pavilions in its pedestrian design, comprised of axial and curving paths that merge into circuses at key points, This notion is further carried out by the circular form of the amenity pavilion itself, which also engages in a formal relationship with the park’s other geometric structures from past and present, such as the carousel, bandshell and ferris wheel. Adjacent to the pavilion, a series of entry courts and seating patios emerge as soft and hardscaped rings, a trajectory of the building form into the landscape as well as an expansion of its visual and useable footprint. 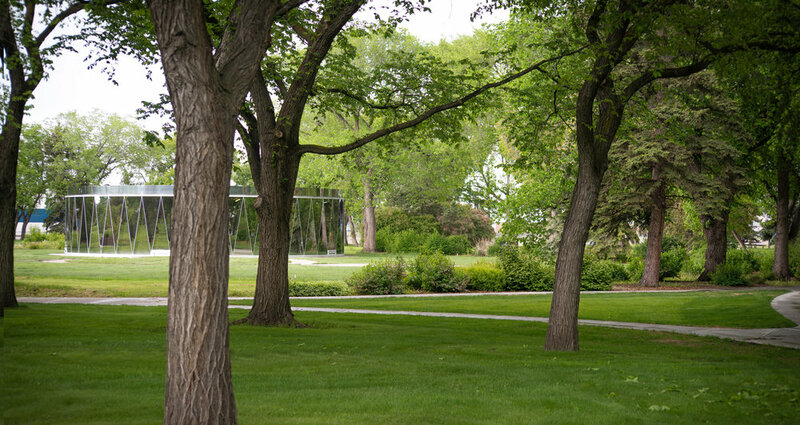 Primary functions of the amenity pavilion are confined to the core allowing a complete 360-degree promenade around the building perimeter to maximize year-round engagement with the park and landscape through a fully transparent exterior skin. This skin, when viewed from the exterior in daylight, is visually impermeable and highly reflective. In mirroring the immediate landscape in striking triangular facets, the building seems almost to dissolve into its idyllic surroundings, lending a fleeting, ephemeral quality to the experience of the pavilion while encouraging a sense of liveliness and interactivity through the device of the façade as fun-house mirror. As a key conceptual driver of the project, play draws on the park’s historic tradition as a popular Sunday attraction for thousands of residents who gathered to picnic, enjoy concerts and ballgames, and partake in a variety of rides on roller coasters and carousels. Fittingly, the pavilion’s form and expressive timber truss structure evoke the playful qualities of children’s toy drums and merry-go-rounds. Material simplicity and structural uniqueness results in a building of studied minimalism, a distinct architecture is achieved expressed through a seamless integrated building façade comprised of a glulam Douglas fir structural frame and a SSG curtain wall system incorporating sealed glazed units. Both structure and cladding are triangulated and faceted, which allows the expression of the structural grid and pattern on the building’s exterior. The resulting floor-to-ceiling glazing provides captivating panoramic views out from the pavilion while blurring the boundary between interior and exterior space, intensifying the sense of connection to seasonal dynamics and to the park itself. An integrated approach to environmental sustainability is evident in the choice of materials: wood, concrete and glass were selected for their durability, permanence and timelessness. The structural ambition of the design emphasizes the use of rough whitewashed laminated timbers, whose rich patina and spatial arrangement recall the iconic structures and materiality of the park’s history while foregrounding the sustainable character of the pavilion. The building’s remaining palette consists of simple materials that, in character, emphasize the surrounding landscape, and in quality, ensure a robust and enduring building.